4/21/15: Mississippi's Tyrell Jenkins strikes out Chattanooga's Miguel Sano. Tyrell Jenkins turned in one of his best starts of the season Monday, but the Braves right-hander didn't fully realize how special the night had been until afterward, in the clubhouse, when he picked up his cell phone to read a text from his mom. "She texted me, 'To God be the glory, I love you, I'm over here shouting and jumping up and down,' Jenkins said of the message he received from his mother, Sharon. "That was good, I'm glad she's happier than me." The Braves' No. 10 prospect delighted his biggest fan by allowing just two hits over eight shutout innings for his second win in four Triple-A starts as Gwinnett blanked Durham, 5-0, on Monday night. Jenkins (2-1) struck out five, walked two and threw 55 of his 97 pitches for strikes in his 20th outing of the year. Vin Mazzaro worked a perfect ninth to finish off the shutout. "I'm happy about it, she's ecstatic," Jenkins said of his mom. "To see a smile on her face and see her happy from just doing something I love and having success with, it means the world." Luke Maile doubled with two outs in the third inning for the Bulls' first hit. Jenkins pitched around a one-out walk to Corey Brown in the fifth and another free pass to start the sixth, inducing an inning-ending double play from Nick Franklin. Taylor Motter singled to start the seventh for Durham's only other hit before Jenkins used another double play to end the threat. He worked a 1-2-3 eighth and Mazzaro struck out one in the ninth. "I didn't realize I only gave up two hits until after the game. They had a good lineup, we knew they could swing it, so we wanted to establish the inside part of the plate, work around that and see how they'd react," Jenkins said. "I got some swings up in the zone with my fastball, so that was good -- my curve and change worked off that. I kept them off balance while working everything off my fastball." But besides the heater, Jenkins said he often thinks of his mother while on the mound. The Texas native grew up without a father, and learned in high school that his mother had been secretly suffering from breast cancer. She beat it, and when Jenkins was drafted, he used his signing bonus to pay off his mother's home and bought her a new car. "I think about her a lot, even when I'm conditioning. When I need motivation ... all the things she's been through ... battling cancer, there's no reason I shouldn't be able to run another lap or do this last set on my lift," he said. "She's motivated me to be the best in whatever I'm doing. That's just who she is. If it weren't for her, who knows where I'd be now." 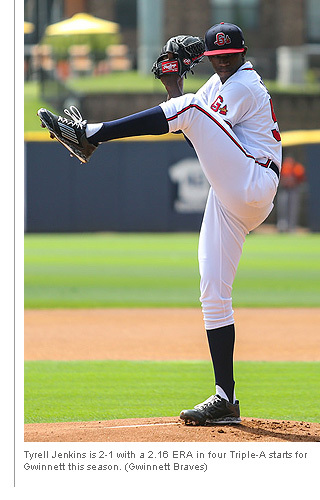 The 6-foot-4 hurler was the Cardinals' Compensation A-round pick in the 2010 Draft out of high school in Texas and was traded to Atlanta along with Shelby Miller last November in a deal that sent Jason Heyward to St. Louis. He sometimes shows off his mother's praise, on Twitter, and on his birthday last week, decided to give away his game-worn cleats to a fan of his mother's choosing. Letting his mom choose the winner has been a strategic move, though. "Usually the key is I let my mom choose so they get mad at her [for not winning]" he laughed. "I let my mom get involved with things like that, she's always been there for me, so I have her pick out the winner and whoever wins it, wins it." The 2015 Southern League All-Star also used some strategy Monday when he walked off the field after the eighth inning and slid past manager Brian Snitker in hopes of closing out the contest. "My manager told me, 'Great game,' and tried to shake my hand, but I tried not to acknowledge him and walked right by him," Jenkins said. "He came down the stairs and found me, so I really couldn't hide for too long." The 23-year-old began the season at Double-A Mississippi before making his Triple-A debut on July 9, when he pitched seven shutout innings to beat Norfolk. In his two home starts at Gwinnett, he's 2-0 with 15 scoreless innings. The righty wasn't necessarily more effective pitching at home in the Southern League, though -- he was 4-2 with a 3.04 ERA in nine starts at Mississippi and 1-3 with a 2.95 ERA in seven starts on the road. He said his road struggles -- not that he's been bad -- came from an interrupted routine. "I didn't even realize that, I knew going into the Syracuse start [on July 17] that I was off my routine, I took eight or nine days off. That was me not having my feel, midseason. I have a routine. I was so lost, that's what got me there," he said. "Last week I pitched very well -- I thought I had my best stuff -- but they put some swings together. I had a no-hitter though five and they put three runs on me. But I'd take that start as one of my best starts. I try to build off each start and keep the ball down and let the defense work." In fact, Jenkins credited his teammates again Monday. "My defense played a heck of a game, two or three big double plays where they really made big plays," he said. "Two of the times they doubled up a guy on line drives, we had some good plays on slow choppers. [Right fielder] Mycal Jones impressed me with a ball that could have hurt me. They called a good game and I was able to execute and put up some zeros." Jenkins and Durham starter Bradin Hagens (1-2) traded zeros for five innings until Jones' sacrifice fly in the bottom of the fifth plated Todd Cunningham with the go-ahead run. Gwinnett added three more runs in the sixth when Christian Bethancourt hit a two-run double and Cedric Hunter added an RBI single. Joey Terdoslavich capped the scoring with a run-scoring base hit in the eighth odd Andrew Bellatti. Atlanta's top prospect Jose Peraza finished a homer shy of the cycle as well. "I like the game when it's 0-0, I like pitching in tight games," Jenkins said. "It's harder to focus when I have a 5-0 lead. I tried to focus when it was 0-0, be aggressive, pound the zone, and I was able to pitch well enough to get through eight. I tried talking my way to nine, but that didn't happen."